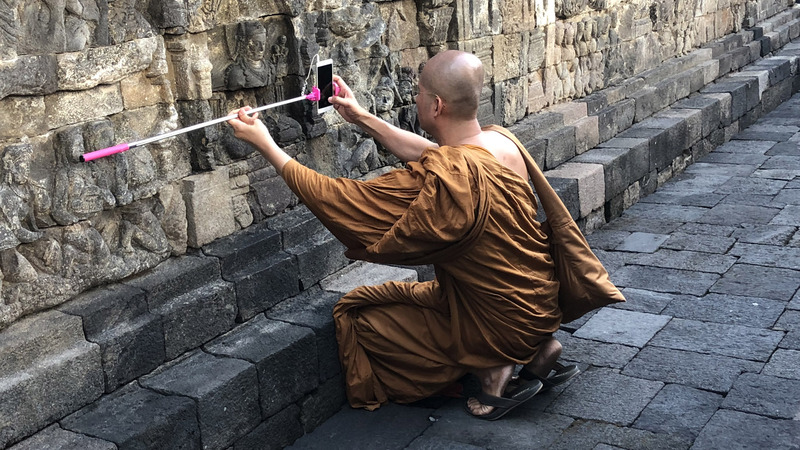 Climbing up the circuitous pathway of the Borobudur temple just outside of Yogyakarta, Java, I encountered a sight that revealed the sheer magnitude of the infiltration of the selfie into our mediated lives. The selfie, the compulsive act of narcissism, rooted in our innate desire to look deeply in the virtual mirror to gaze at our digital reflection, has been seized by religious monks who are just as intent to contemplate the medial gaze. If Nam June Paik’s mid-1970s TV Buddha was an ironic caricature of the modern Buddha eternally contemplating the self through the unblinking eye of the live, closed circuit television signal, here, an actual Buddhist monk brings Paik’s electric sculpture into the present day by gazing intently at his own image through the even more contemporary media tools of the mobile phone and selfie stick. Now, everyone is a TV Buddha, no one is too holy to get into the act. There is no escape from the selfie. In fact, the closer you get to the holiest, most sacred sites in the world, such as the majestic Borobudur – originally constructed in the 9th century AD and rediscovered in the early 19th century – the more the selfie compulsion overtakes this space of contemplation. The selfie radically shifts contemplation away from the site and turns it back on one’s sight, one’s own image, one’s desire to force documentation on the experience of being in the place, rather than actually being. It’s as though we don’t exist unless we photograph the moment. And furthermore, we are incapable of sharing the social dynamic of the moment in the physical space around us without mediation. We need to resituate social relations in the remote, distributed space of social media. Each and every moment of great import is transferred to the third space, that shared network space conjoining the local and the remote, where we are gradually and assuredly shifting our lives, our friendships, our experiences, and our contemplation. It is through the lens of the phone that we now access the moment: especially that of the sacred and mystical. Let Budhha lead the way! As we travel the walkway ascending Borobudur, where the design of the temple is intended to lead us on a circular path to enlightenment, we may not find our self, but will find our selfie. When we reach the zenith of our pilgrimage, it may not bring Nirvana, but it will direct us deep into the lens of the camera where in the depth of a medial unknown, we will find our new inner selfie: digital, reproducible, distributable, disposable.